I know I disappeared for the week, but I am really doing okay. I didn't want you all to think I like fell into a pit of grief or anything. Not that I have not been sad, I have been, but in a lot of ways I have been more sad this week over Missy... and in some ways that feels wrong, but I think even Pa would understand. I looked at my Pa, surrounded by his wife, his children, his grandchildren and his great-grandchildren and while being sad over this great loss to our family, my heart broke a little more over my sister's life being cut so short. So, maybe I have actually been struggling with grief this week. As we approach the year anniversary of losing Missy we were back at a church, surrounded by flowers, friends and family. And as we celebrated our Pa, and our hearts broke over this loss, we were reminded of how familiar grief is to us. And that was hard. It's just all hard. 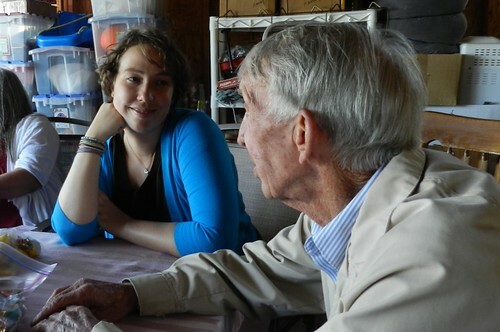 I found this picture of Missy and Pa when looking for pictures for his service. I adore it. Missing her never gets easier. Thankful for peace in knowing that I will see her again someday. Thinking of your sweet family. Lots of love.